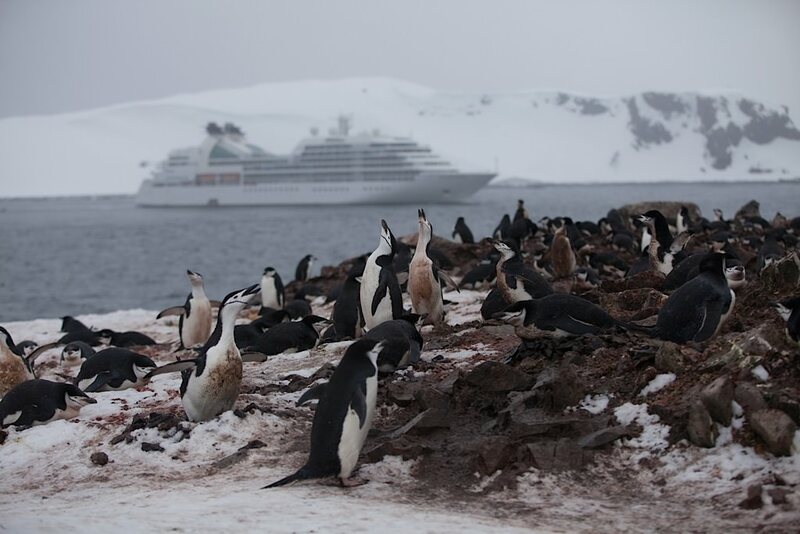 Seabourn Quest anchored off Half Moon Island, with Chinstrap penguins aplenty. © 2014 Avid Travel Media Inc.
Penguins live almost exclusively in the Southern Hemisphere, particularly Antarctica. Their wings have evolved into flippers, an adaptation to the fact that nearly half of their lives are spent in the ocean. They feed on krill, fish, squid and other forms of sealife. The Emperor Penguin is the largest among the species, averaging about 3 feet 7 inches (1.1 meters) tall and weighing 75 pounds (35 kilograms) or more. The smallest penguin species is the appropriately named the Little Blue Penguin (also called the Fairy Penguin), which is slightly taller than a Barbie doll, at 16 inches (40 centimeters) in height and weighing only a little more than 2 pounds (1 kilogram). You’re not likely to see the large penguins — King and Emperor penguins — in Antarctica. To see those, you will need to do a cruise that includes the Falkland Islands or South Georgia. Prehistoric penguins, I learned while researching these fabulous creatures, could be as tall as and as heavy as humans. Some 30 million to 40 million years ago, Nordenskjoed’s Giant Penguin grew to nearly 6-feet (1.80 meters). Can you imagine confronting a penguin of such proportions? Though their wings are useless for flight, penguins are agile swimmers. That’s because the penguin’s vestigial wings have evolved into flippers. Using those flippers, penguins can swim at remarkable speeds, up to 17 miles per hour (27 kilometers per hour), and some species can dive deep. Emperor Penguins, for example, have reached depths of 1,870 feet (565 meters) for up to 22 minutes. Their black and white appearance protects them from predators. Looking upward, for example, orcas and leopard seals have difficulty distinguishing the white penguin bellies from the water’s surface while the penguin’s dark back camouflages it from above. A thick layer of insulated feathers keeps the penguin warm in water. In the extreme Antarctic winter, penguins control blood flow to their extremities, thus reducing the volume of blood exposed to cold while keeping their feet and wings from freezing. Exposed to temperatures that can dip to the most severe on the planet (the record was 128.6 °F /89.2 °C at the Soviet Vostok Station in Antarctica on July 20, 1983) penguins often huddle together to keep warm, and they rotate positions so that each penguin gets a turn in the center of the heat pack. Penguins are, in fact, extremely adept at conserving energy — often in some creative ways. In addition to waddling, for example, they can slide across the snow on their bellies (tobogganing), to save energy while covering significant ground. Penguins breed in large colonies for the most part, which explains why you may see so many in one place. Most are monogamous for the breeding season and the couple shares the incubation period, with males and females taking turns keeping the eggs warm while the other feeds at sea. Penguin Sounds from Ralph Grizzle on Vimeo.